GFP targeting by various P. falciparum redox proteins of the glutathione system. 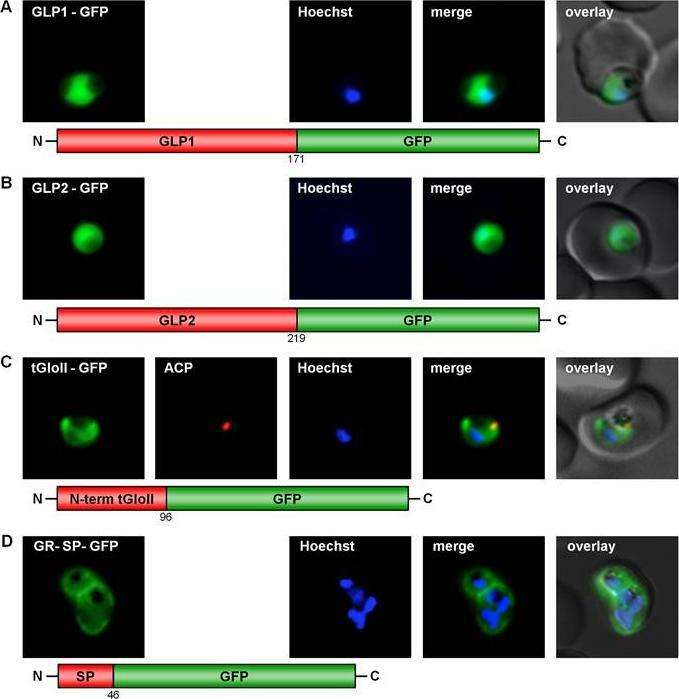 (A) Cytosolic localization of GLP1. (B) Cytosolic localization of GLP2. (C) Dual localization (cytosol and apicoplast) of the tGloII N-terminus. (D) PV-localization of the signal peptide of GR (the parasites showed a fast bleaching fluorescence, leading to a high background signal). Live cell imaging of erythrocytes infected with transgenic parasites for solely cytosolic GFP signals. Colocalization of GFP and the apicoplast marker ACP in fixed, immunodecorated cells.Kehr S, Sturm N, Rahlfs S, Przyborski JM, Becker K. Compartmentation of redox metabolism in malaria parasites. PLoS Pathog. 2010 6:e1001242.